WORLD is fully equipped to handle in-circuit simulation testing, diagnosis, and repair of virtually any type of circuitry. 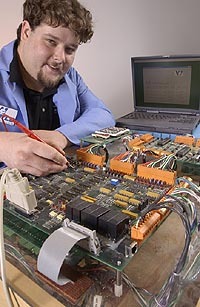 Our technical staff is well rounded, capable, flexible and will be happy to create standards and procedures for computerized testing of your equipment. Alternatively, we will work independently from your circuit and develop custom hardware and/or software to perform necessary diagnostics. Whether as a part of our manufacturing process, or as an independent test or repair facility, we always welcome contract testing assignments. Please discuss your production testing needs with us. WORLD will be pleased to provide a written estimate of test performance, time and costs, upon your submission of a schematic diagram and general parameters.